Interested in getting into the craft of welding but unsure of where to begin? You’re looking in the right place. Finding the best welder for beginners can be tricky, as there are so many shapes and sizes out there that it can get a little overwhelming. There are right and wrong types of welders to choose when you are starting from the bottom, so doing your research into the proper option for a beginner is incredibly helpful. If you are new to this craft, you may be wondering why you should even be looking for the best MIG welder. After all, why invest in a potentially expensive object when you aren’t looking to do the craft professionally – won’t a cheap knockoff work? The reason is because quality matters. A good MIG welder is important for a beginner to practice with. If you’re new to this practice and the first MIG you encounter is a poorly constructed knockoff brand that can barely complete a successful weld, you will probably be turned off to the craft completely. When you are first learning how to do a MIG weld, you will learn about how the automatically fed spool creates an electrical current that melts and joins wire to the base. A quality MIG will ensure that this process is as simple and clean as possible, and also allow you to experiment with all kinds of metals regardless of how thin or thick the plates are. Few MIG welders will stand out on their own as much as this handy tool. Miller is a respected brand by even the most seasoned workers, so you know going in that they are going to produce something good. And despite this being more of an entry level machine, Miller more than delivered on those expectations. The features and specs on this handy little welder are really impressive. 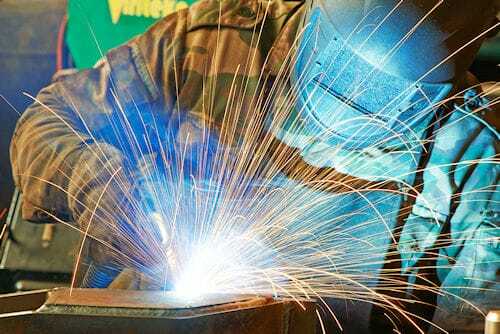 Even if you are a beginner at mig welding now, you can be assured that as you grow in skill and take on more complicated jobs the Miller will handle what you throw at it. Thermal Overload Protection – Because this machine heats up so much, the manufacturer incorporated this feature to ensure that it stays user friendly. Quiet Operation – One of the initial things you will note upon using this machine is how incredibly quiet it operates. Unlike the other heavy-duty versions on the market, this features a unique cooling fan that you won’t even notice is on. You can connect to up to a 220-volt current and still maintain that same low volume level. Efficient Handling – Most serious pieces of equipment are bulky and difficult to handle, but this model weighs in at just under 50 pounds, making it significantly lighter than other comparable options. This lightweight design allows for more portability to work on your passion anywhere, but without having to sacrifice build quality. Beginner Friendly – While even the most experienced craftsmen and women can benefit from this tool, it is also incredibly beginner friendly. 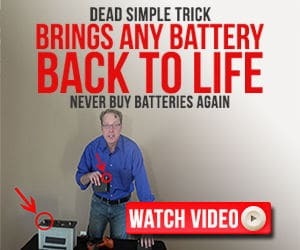 It has the benefit of being able to be powered by nearly any kind of DC circuit, so beginners don’t have to rack their brains trying to figure that out on top of everything else. Long Lasting – Made from a metal and aluminum composite with well-crafted internal components, it will definitely allow for years of relentless use. Accurate – What good is a weld tool if it isn’t spot-on? Fortunately, this guy ensures that you get optimal performance no matter what material you are using, whether it is a mild metal, stainless steel, or aluminum. Flexible & Portable – The lightweight nature of this tool partners with its ability to be powered by any DC circuit to allow for an impressive range of power input flexibility. This means that you can use it virtually anywhere, from inside your home to a professional industrial work area. 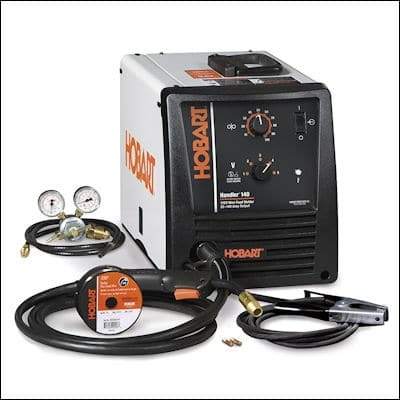 Versatile – You have the freedom to also perform flux core welder jobs thanks to the high-performance versatility that this model possesses, which is hard to find in competing models. Price – Pricing at around $1,279.00, this is certainly not the cheapest option available on the market. A beginner may be more interested in another type that works similarly but comes with a slightly less intimidating price tag. Additional Features May Prove Confusing – This multifunctional tool can handle both flux cored welding and MIG, as well as a variety of additional unique functions that would excite and entice a professional but may prove useless and daunting for a beginner. 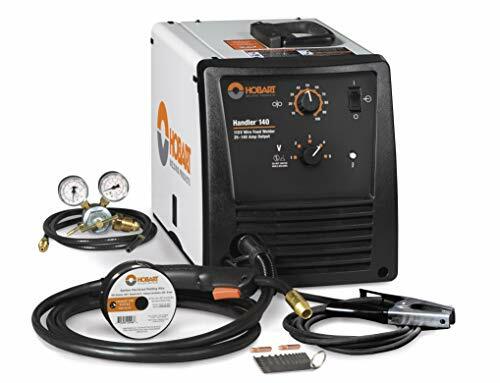 This Miller machine will truly give you one of the highest quality welds you could ask for, while also being conveniently portable and easy to manage. 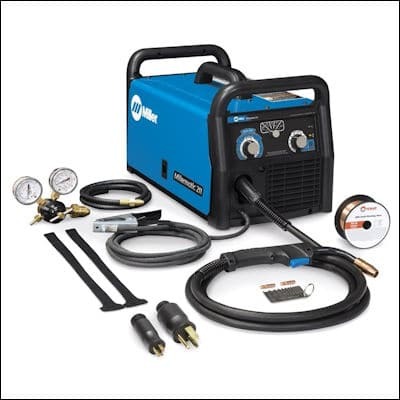 The Miller Electric MIG Welder may not be for everyone due to the high cost, but if welding is one of your long-time passions then this could be the tool for you. Includes: 10 ft. M-10 MIG Gun, 10 ft. Work Cable with Clamp, Built-In Gas Solenoid Valve, Dual Gauge Regulator with Gas Hose, Sample Spool of 0.030 in. Solid Wire, (2) 0.030 in. Contact Tips, (2) Hook-and-Loop Cord Wraps, Material Thickness Gauge Overall Width: 20-1/2" Standards: CSA Certified Overall Height: 12-1/2"
Another respected brand name on the welding market is Hobart. This model is one of the more affordable options from Hobart you will be able to find, which is always enticing for newer craftsmen. It is much better to fill out your shop with solid brands rather than skimp on no-name tools. American made and well known in the farming community, this welder has a lot of qualities that make it one of the highest-ranking options in the industry. Impressive Capability – You will certainly find some impressive versatility in this capable Hobart tool. Whether you are looking to weld anything from 24 gauge to ¼ inch material, like steel, you will find that it hardly makes a difference with the handling. 10 Ft Gun and Ground Clamp Leads – Tired of dragging your heavy tools around? The ground clamp and gun feature 10 ft leads that allow you to easily move it around, and gun tips are easy to find and replace as it uses standard consumables that can be purchased at most local home goods stores. Power Current Suitable for Beginners – One big benefit is that it can be used in any normal household, as it can run on a current with a range of 25-140 amps. This allows beginners to be able to start practicing whenever and wherever they want! Weight – Weighing in at 57 pounds, this is not the most easily lifted option out there, especially compared to the previously mentioned Miller. Better Suited for Thinner Material – While this Hobart can certainly handle up to ¼”, you may find it easier to stick with thinner materials. Which, for newbies at this, may be better anyways – it is the serious welding workers that may want to keep their eyes out for a larger model. With simple controls and various capabilities, this model is one of the best bangs for your bucks out there. As far as small MIGs go, a $480.00 price tag isn’t bad for something as portable and convenient as this. You can expect a lot of reliable use from this Hobart, regardless of if you’re building workbenches or doing exhaust systems. 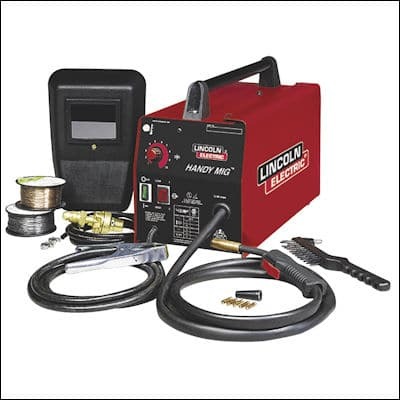 Another great option for smaller welding jobs is the Lincoln Electric K2185-1 Handy model. Lincoln is a company that has been established for well over 120 years, so it is safe to say that they know their stuff in this department. That should be a great comfort if you are just getting started with this type of welding. Knowing your equipment manufacturer has been working to improve for over a century means their products have a history of working for their customers. Long Life Expectancy – The ever-reliable Lincoln brand doesn’t use anything less than the best constructed parts to build their products, so you can expect this equipment to have inherent longevity. This fan-cooled product can be used day in and day out without running into any hiccups, so you can buckle in and get to work! Additional Perks – If you purchase this Lincoln, you will find that it comes with no less than 6 contact tips (3 that are .025” and 3 that are .035”), 3 pounds of spool (2 pounds of .025” and 1 pound of .035”), a regulator, a gas nozzle, a gas-less nozzle (for flux-cored jobs), a hose for MIG purposes, and a hammer/chipping brush. Needless to say, having all of this on hand is incredibly convenient. Diverse – This Lincoln product gives you the option to weld with both MIG and flex core (shield gas can be purchased separately). This multi-use benefit doesn’t cause any delay in your work, making it very handy. Affordable – This product definitely tops the extravagant Miller product in affordability. For under $400, you can get an incredibly diverse product that gives you the ability to achieve maximum craftsmanship with both wire and gas, making this price an absolute steal. Warranty – Another benefit locked in with the affordability is the warranty – 1-year on both parts and labor. Starting from your initial date of purchase, your product is backed by the reliable warranty that lasts for one year, so you can rest easy knowing that any replacements or repairs that relate to the manufacture or failure of the product are covered. Spool Capacity is Limited – If you’re looking to house any larger spools of wire, like 10-pound spools, this welder cannot accomplish that. This leads to the inconvenience of an increase in the number of times that you need to re-spool, but that isn’t the end of the world – especially with how easy it is to transport. Lacks a Gas Gauge – This means that you may not be aware of when your gas is running low, but with careful planning this can become merely a minor inconvenience and is easily overshadowed by the sheer number of positive takeaways from this product. If you are extra handy, you can even add your own gauge to completely circumvent this drawback. If you’re a beginner who isn’t looking to weld any serious thick metal plates, this could be perfect for you. 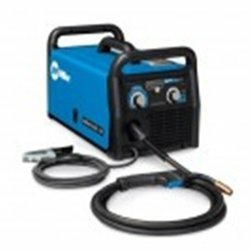 It gives you the opportunity to do some pretty powerful welding, while also being able to carry it easily and utilize different methods. 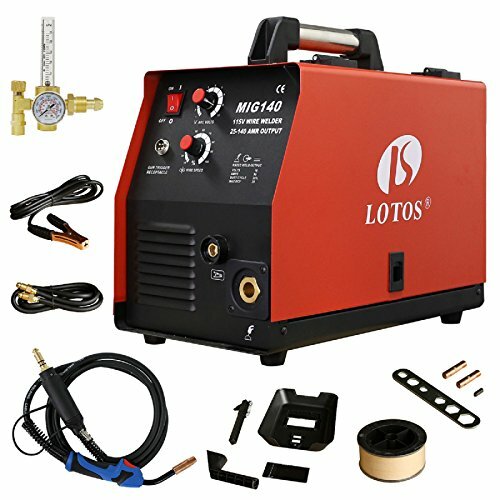 The rugged Lotos MIG140 140 Amp welder is built with sturdy materials, reassuring consumers that it can withstand a little knocking around. And let’s be honest – that is inevitable in any work space or garage. 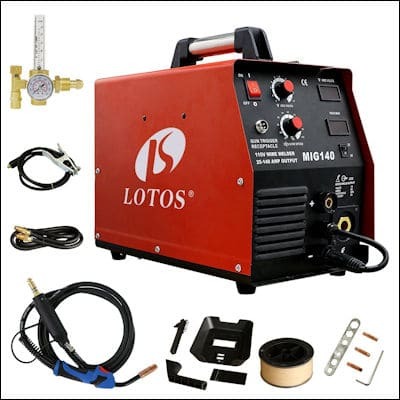 The Lotos goes beyond just offering a great welder at a reasonable price – they also throw in a complement of needed accessories, which is perfect for someone just getting started. Rather than searching around for the other pieces you need, Lotos puts them all together into one package. Let’s take a look at why this affordable model is so coveted. Variety of Wire Feeders – A big benefit of this product is the variety of automatic wire feeder sizes it comes with. With this package you will find a solid steel range of .025” to .030” and a flux core wire range of .030” to .035”. Still not enough? You can also find two other wire sizes (.023” and .035”). Complete Package – Aside from the unit itself, it also comes equipped with a new grounding cable designed to connect quickly, a gas hose, two feed wire spools, contact tips, MIG torch, a welding mask, and an argon gas regulator. Price – As the cheapest option on this list (you can take it home for under $300), it may seem too good to be true. However, this tool performs consistently well and, if you’re still having doubts, you should know that it also comes with a 1-year warranty. Multiple Uses – Whether you want gas operation or gas-less, MIG or flux cored, this tool has got your back. Durable – This product is pretty lightweight (54 pounds) but still heavy enough for you to not be concerned about breaking it by moving it too roughly. It can be transported easily from one job to the next and continue running smoothly. Wire Feed Issues – It has been noted by some consumers that the wire feeder has some issues. To make sure that you don’t fall victim to this, simply test all of the different components of the unit when it first arrives. Fortunately, there is a 30-day money back guarantee, so as long as you identify any problems as soon as possible you should be in the clear. 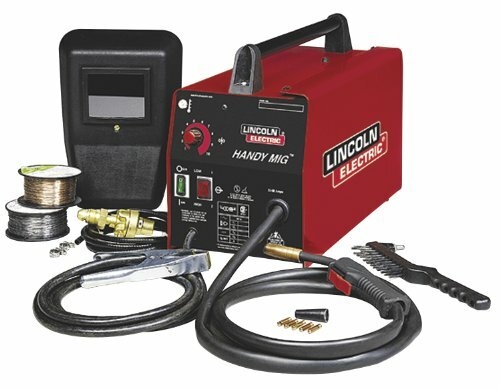 This inexpensive product gives you an impressive amount of accuracy control as well as a complete unit package, which is great for a beginner because it gives you the opportunity to feel out the different welding options and decide what you like to do and how you like to go about it so that you can continue practicing this unique craft.